The new law will apply to patients who go to a healthcare facility in their health plan network and inadvertently receive services from a non-network provider. Patients would only be responsible for paying their usual in-network cost-sharing. Plans and non-participating providers would have to work out payment for those services through a state-arranged, voluntary dispute resolution process, with a penalty assessed to the party that refused to accept an offer that was close to the final arbitration order. The negotiation would be based on the usual and customary rate for the particular geographic area. Disputes could be taken to court. The bill would only apply to PPO-type plans, since Florida already bars balance-billing patients in HMOs. 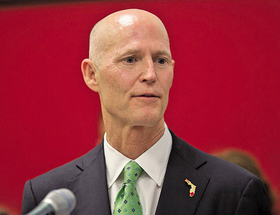 On Thursday, Scott also signed accompanying legislation to increase price transparency in Florida hospitals. “This legislation is an important first step as we continue to address the high costs hospitals pass on to patients and their families,” Scott said in a written statement. The Republican governor launched his transparency initiative after doing battle last year with Florida hospitals over Medicaid expansion, which hospitals favored and he opposed. Numerous consumers told Florida officials about situations where they had to pay hundreds or thousands of dollars in balance bills when they had not known they were being treated by out-of-network providers. Florida Insurance Consumer Advocate Sha'Ron James cited examples including a Boca Raton woman who had to pay more than $80,000 to an out-of-network surgeon at an in-network hospital. New York state implemented a similar, though mandatory, dispute resolution system last spring, requiring insurers and providers to resolve out-of-network payment disputes while holding patients harmless. The Florida legislation had the backing of the Florida Medical Association and the Florida Association of Health Plans, while the Florida Hospital Association said it agreed with the “general direction” of the bill. Anesthesiology and radiology groups opposed it. Meanwhile, in California, a broad coalition of payers, unions, consumer advocates and some providers are backing a similar bipartisan bill that nearly passed the Legislature late last year and now is being considered in amended form. The bill would establish a binding independent dispute resolution process for insurers and providers in cases where patients received care from out-of-network providers at in-network facilities. Patients would only have to pay their normal in-network cost-sharing, and those payments, unlike now, would apply to their plan's out-of-pocket yearly limits. The proposed system would apply only to non-emergency care, since emergency physicians already are barred from balance-billing patients under a prior state Supreme Court ruling. But the California Medical Association strongly opposes the bill, arguing that it would hinder consumers' ability to use their plans' out-of-network benefits and give plans too much negotiating leverage over physicians.